Eating the right snack can help keep your body healthy, but are all snacks the same? Definitely no, especially if you have some healthy problems like diabetes. When you have diabetes, you need to take into consideration how the carbohydrates in some snacks can affect your glucose levels. When carbohydrates are broken down, they turn into sugar which when consumed in high quantities can cause the blood glucose levels to increase. So the best snacks for diabetics are ones that are low in carbohydrates. Here we list some healthy snacks you can surely include in the diet. Whole wheat crackers are a great alternative to regular crackers. Paired with individually wrapped low-fat cheese, this is a great snack option for those who are trying to keep their glucose levels lower. While this snack is sweet, it won't cause your blood sugar levels to spike. Combine a tablespoon of almonds with a tablespoon of dried cranberries for your own homemade trail - mix that only has 20 grams of carbohydrates. Not only will the almonds keep your glucose levels balanced, but they will also help you feel full for longer. Plain Greek yogurt is full of many healthy vitamins and minerals, which makes it a great snack for those with diabetes and those without it. You can add a tablespoon of raisins to the top of yogurt for even more antioxidant benefits. The raisin will add a sweet note to the yogurt without having a negative effect on blood glucose levels. For a delicious and filling snack, blend together half a banana with half a cup of nonfat yogurt and a half a cup of your favorite frozen berries. For a thicker shake, you can add in some ice as well. This smoothie only contains about 150 calories and can be a refreshing mid-day snack. 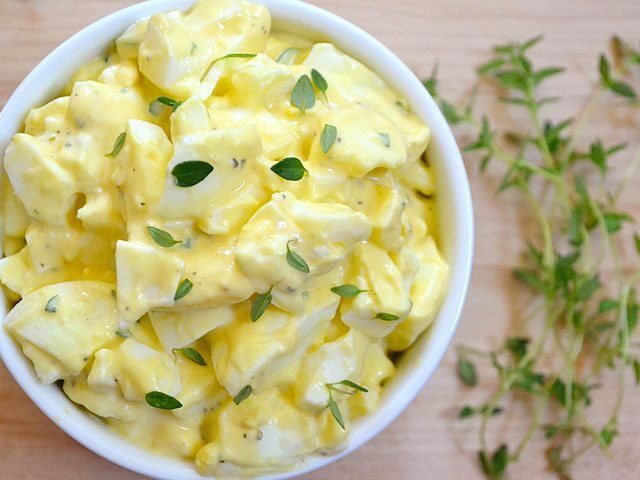 For a snack that is filled with plenty of protein, mix up your own egg salad. Mash a hard-boiled egg with a teaspoon of low-fat mayonnaise and then spread over a piece of whole grain bread. This is one of the snacks for diabetics that can be versatile. 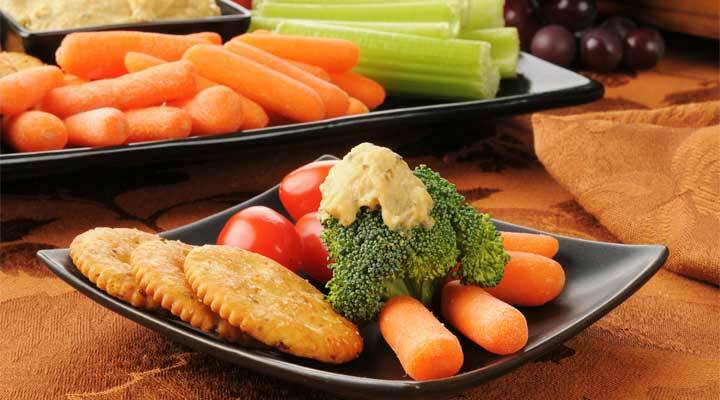 Slice up some of your favorite veggies like carrots, peppers, broccoli or cucumbers and dip them into a third a cup of hummus. Hummus contains a lot of fiber even though it can be high in calories. With only 20 grams of carbohydrates, apples make a great snack for those trying to lower their blood glucose levels. Try eating a whole apple, skin on, with a tablespoon of organic peanut butter for a healthy snack that will reduce your food cravings and balance your glucose levels. A great alternative to unhealthy chips is light popcorn. One serving size is around 3 cups so you can eat more without consuming the negative unhealthy fats. Just be sure to check the ingredients on any pre-popped popcorn and avoid any that contain hidden sugars or hydrogenated fats. Still, have a craving for those salty potato chips? Try making your own veggie chips instead of the high sodium and carbohydrate-filled potato chips. Kale chips can be a quick make at home by mixing kale leaves with a little bit of olive oil and sea salt. Spread the kale out on a cookie sheet and bake in the oven. You can make a healthy mini pizza that is quick and delicious. Use a six-inch whole grain tortilla and top it with low sodium tomato sauce, olives, mushrooms, roasted red peppers, sauteed onions and an ounce of shredded cheese. Heat in a microwave or toaster oven for about a minute and this is one of the snacks for diabetics you can really enjoy. White carbohydrates are digested as sugar by the body. They contain little nutritional value and will cause the glucose levels to spike. Full-fat dairy products often contain a significant amount of saturated fats which will cause the bad cholesterol levels in your body to rise. These saturated fats can also have a negative effect on insulin resistance. French fries, potato chips, fried chicken and other fried foods are soaked with unhealthy oils. Not only does this add more calories to your snack, but will make the glucose levels out of balance. Alcohol can have a terrible effect on blood sugar levels. Even one glass of wine can cause the glucose levels to spike. While moderation is often the best practice for consuming alcohol, it is best to check with your doctor if you have diabetes before you consume any alcohol. Pop, fruit juices, sweetened tea, and lemonade are filled with sugar which is obvious, not healthy for those with diabetes to consume. Not only are the sugar levels in these drinks high, they often will also contain high fructose syrup which can change the metabolic rate and result in weight gain. Most breakfast cereals contain high amount of carbohydrates and are highly processed. These cereals will increase blood sugar levels and often provide no protein, so you won't stay full for very long. While plain yogurts can be one of the best snacks for diabetics, flavored yogurt isn't the same. Flavored yogurts can often contain a high amount of sugar which will increase the blood glucose levels. Many individuals try to reduce their white sugar intake by replacing them with more healthy alternatives like agave or honey. Unfortunately, even these healthier sweeteners can contain just as many carbohydrates as tradition white sugar. While they may seem convenient, pre-packaged snacks contain a significant amount of refined flours. This will cause the blood glucose levels to spike quickly. Besides, they provide no nutrients. While plain black coffee can be healthy in moderation, the flavored drinks should be avoided. Flavored coffee drinks will not only contain additional carbohydrates, but are also loaded with sugar.